Last time I wrote about my views on feminism and how sometimes even the full-blown feminists can’t seem to agree. That got me thinking about some specific groups of the geek community that can’t seem to get along: Star Wars and Star Trek fans! And, by the end of this, I guess I’ll be revealing which group I belong in! 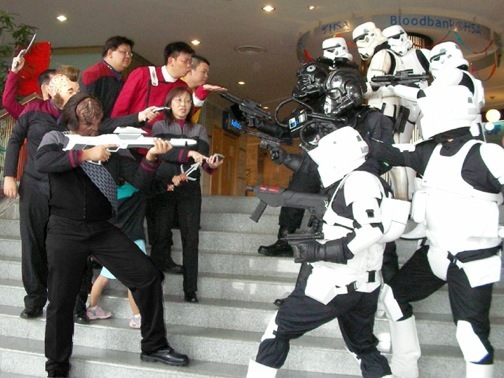 Is one of the Star Trek guys actually blowing a kiss to the Stormtroopers? Let me start out by saying that I do actually have an interest with both of them. I loved how they have really big stories and are actually smart. They’re also filled with a lot of hope for the future and have a positive message. Not only that, both Star Wars and Star Trek have such wonderful characters for the most part (I’ll elaborate further when I get to them individually). But still, each of them are different in their own right and I get why some Star Wars fans hate Star Trek and vice versa. First, let me talk about Star Wars since I “encountered” it before Star Trek. I actually watched Episode I when I was around 4 years old. My brother was so excited to watch The Phantom Menace on the first day of showing he actually called in sick to work so he could! But, sort of as punishment for playing hooky for the day, my parents said it was okay to watch it but he had to bring me along. I honestly didn’t know that this movie was a prequel of something called Star Wars. So, when my brother was talking with his friends about the movie after we watched it (they didn’t go to work as well), they were talking about a lot of things like how the kid will become bad in the end and how the green puppet guy will go teach his son. 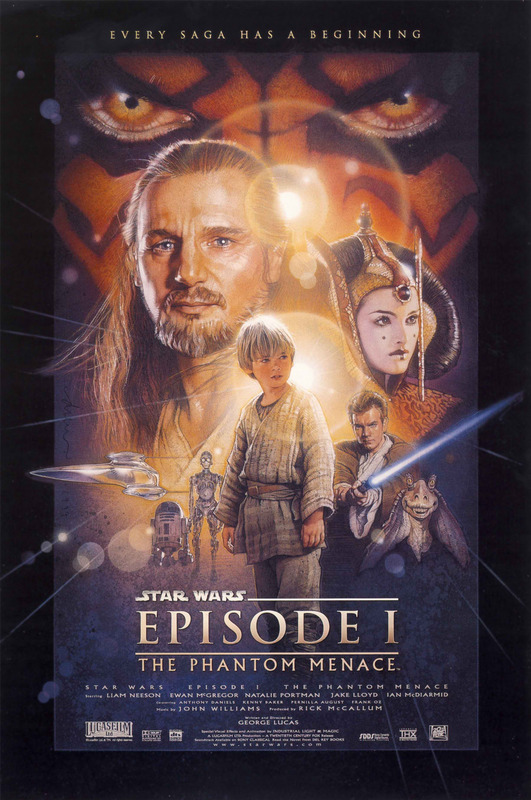 Well, I didn’t know that The Phantom Menace was a prequel to the original Star Wars. In fact, this was the first Star Wars film I watched. I was actually amazed that my brother and his friends complained about the movie so much. My 4-year old self really enjoyed it. I loved the big battle scenes. I loved the intricate costumes (especially Queen Amidala’s outfit!). And I actually loved the comedic relief of Jar Jar Binks! Well, I was 4! I really didn’t know any better! You could’ve made a funny face at me for 2 hours and I would have been extremely entertained! Soon after, my brother borrowed his friend’s DVD collection of the original Star Wars trilogy so he could re-watch the entire thing. I got to watch all three films that night and I was really fascinated with it! Looking back, I really didn’t understand what was happening but I loved all of the aliens (except for Jabba the Hutt because I was actually scared of him). Flash forward six years later and I was a somewhat avid fan of Star Wars. I remember completing the prequels around this time and thinking that it really couldn’t compare to the original films. Maybe because they were prequels. I knew what was going to happen with the characters and there was no real thrill. I knew Anakin was going to be Darth Vader. I knew the Emperor was going to rule the entire galaxy. But the original films were really fantastic! Around this time, my brother was getting really into Enterprise which was, oddly enough, another prequel of a science fiction series! Come to think of it, it’s kind of weird that my initial exposure to the two most popular sci-fi franchises seem to be prequels. Go figure! Anyway, I tried watching a couple of episodes of the show and I found it incredibly dull, especially if you compare it to the fast paced action in Star Wars. But I was older now and I started to actually listen for the actual dialogue and not just be impressed by laser lights and explosions. So, while I understood what was happening, my young mind couldn’t really get why anyone would watch Enterprise since, in my opinion anyway, it was still pretty boring! When I told my brother about how I thought it was boring… he actually agreed with me! But not because the stories weren’t exciting (I still say they’re not!) but the adventures don’t compare to the ones shown in The Next Generation. He then let me watch one of his favorite episodes. It was the one where they first introduce the Borg… and what an introduction to the series it was! I was pretty much in awe regarding the Borg! They were pretty much unstoppable in the episode and, in fact, I was pretty shocked that, by the end of the episode, they couldn’t figure out a way to beat them! The heroes actually had to run away! Then again, I really liked Q’s personality since he actually taught the crew of the Enterprise that, no matter how much they learned, they were still insignificant. It was a pretty deep lesson and something I could understand. Oh, and the Borg had a pretty cool catchphrase! I then tried watching some more episodes of The Next Generation and I really enjoyed how deep a lot of the stories actually were. While Star Wars was pretty, well… mindless, Star Trek had stories that dealt with philosophy and actual morality questions which intrigued me… even though I was pretty young. I then tried re-watching some more Enterprise stories… and I still found them boring. I guess my brother was right; Enterprise just didn’t compare to The Next Generation. I think I watched all episodes of The Next Generation on cable TV. I tried watching the other versions of the show, like the original version, Deep Space Nine and Voyager but they didn’t hold my interest as much as The Next Generation did. So, overall, where do I side? I guess I still fall on the side of The Force. While Star Trek drew me in because it was an extremely intelligent show, Star Wars simply appeals to the kid in me. I guess, while I do like to use my mind once in a while, there’s just something visceral about just turning it off and just letting the experience wash over you. While both shows make it seem that space is a relatively safe area to go, I really think that’s a big, fat lie. And I’ll talk more about that next time! Are you a Trekkie? Or are you more of a Jedi follower? Whatever side you’re on, please leave them in the comments section below!